The Ultimate Postal Scale - awarded 'Best Buy' status by 'What to Buy for Business' magazine in its September 2005 survey. The Cherlyn MH 530 represents the ultimate in current Postal Scale design, covering all Royal Mail and Parcelforce services and options. They are ideal for companies sending parcels and mixed mail overseas, where substantial savings can frequently be made, including new discounted prices for franked First Class mail. All Royal Mail and Parcelforce services and their service options are ready programmed into the MH 530 Postal Scales. For overseas mail, you can select the destination either by zone or by country. The large backlit display provides detailed information of the selected postal service and any options, with postage cost displayed in large digits. 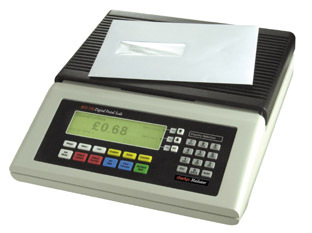 The scales are really easy to use and help you to get the best value out of the Postal Services. If you want a service option, such as a signature on delivery, or compensation if the item is lost, just press the 'Options' key. This will show you all of the available options for the selected service. Just pick the option you require, and the postage will be adjusted accordingly. Not only will the scales accurately weigh and price your letters and parcels instantly, but the Mailsaver feature will also show you a list of all lower cost alternative services to the same destination. This comparison can include the carrier services you have put in. As you can imagine, the savings can be substantial! The MH 530 Postal Sales are high quality British made products, that are right up to date with the latest Royal Mail and Parcelforce services. They are designed to help you through the complexities of the mail services, to improve efficiency and save you money on postage at the same time. If your postal requirements do not include any Parcelforce services, inland or overseas, or you don't send items other than letters overseas, then the MH 520 Postal Scale will probably meet your needs.